Photo Slide Show Time creates eye dazzling photo slideshows from batches of photos you took from a wedding, an anniversary, or any other event you took a bunch of photos from. Photo Slide Show Time creates photo slideshow videos in all popular video formats like MP4, AVI, WMV, FLV, MKV, 3GP, MOV and more ... The program is easy to use with practically no learning curve. Photo Slide Show Time creates eye dazzling photo slideshows from batches of photos you took from a wedding, an anniversary, or any other event you took a bunch of photos from. Photo Slide Show Time creates photo slideshow videos in all popular video formats like MP4, AVI, WMV, FLV, MKV, 3GP, MOV and more ... The program is easy to use with practically no learning curve. 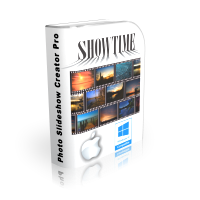 Here is a list of Photo Slide Show Time capabilities: picture slideshow maker with music, photo slideshow maker for pc, picture slideshow software for pc, photo slideshow app for pc, picture and photo slideshow producer software, photo slideshow maker with music. Watch videos made with Photo Slide Show Time here.